This summer, Square Enix is releasing a new third-person shooter dubbed Gunslinger Stratos. It's not a home console game—yet. Rather, it's a four-on-four team-based online arcade game that allows players to battle others in game centers across Japan. 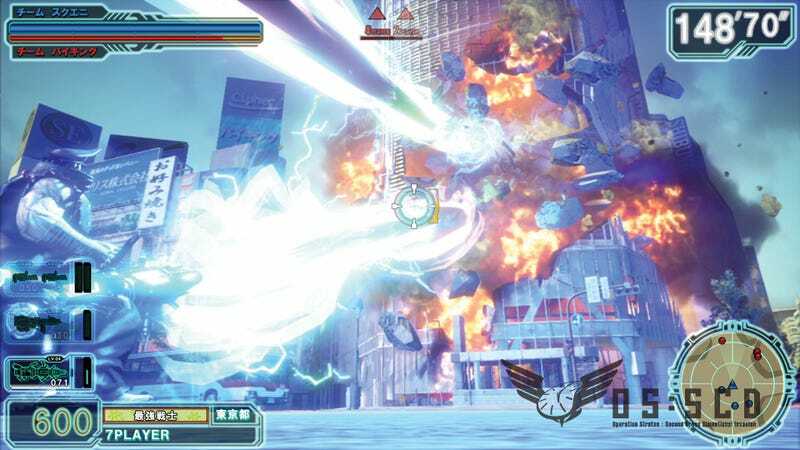 Gunslinger Stratos runs at a brisk 60 frames-per-second on 60 inch, full HD displays. It's slated for a summer release in Japan. Even though, I'm inclined to say anything "stratos" that doesn't have "Lancia" in front is going to be pretty stupid, Gunslinger Stratos could be a fun arcade title. It's a dual-wielding GunCon game that allows players to conjoin two pistols to form new weapons, such shotguns or rocket launchers. The weapons differ from character to character. And speaking of characters, artist Mari Shimazaki, who designed the character Bayonetta, did work on Gunslinger Stratos. Check out the game's official trailer in the link below or the screenshots in the above gallery.